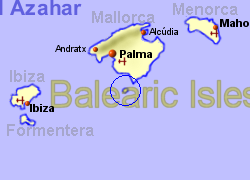 The Cabrera National Park, a group of 19 small islands and islets, 10 Km south of Mallorca, in the Balearic Islands . The park covers 10,021 Ha, 1,836 of which are land, most of that being the Isla de Cabrera which is 5 Km across at its widest point, and although it has only been a National Park since 1991, its lack of human interference has ensured a well preserved environment. 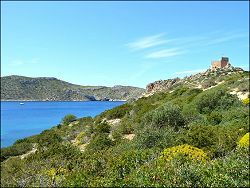 430 species of plants are found on the islands, 30 of which are not found elsewhere, and 80% of the worlds Balearic Lizard live here. The deep quiet water (boats are not allowed to anchor around the islands and diving is strictly prohibited) surrounding the islands are an ideal breeding ground for turtles, dolphins, sperm and pilot whales, the carnivorous Goby fish, massive fan mussels (up to one metre in length) and coral. The quiet environment also makes it an important area for seabirds and birds of prey. 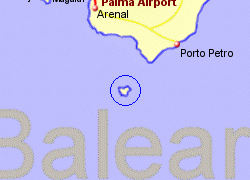 Boat trips are available to the Cabrera from Colonia de Sant Jordi and Porto Petro (on the south coast of Mallorca), and hiking is available, there is also a tourist information office, a museum, and a 14th-century castle, gift shop and cafe. 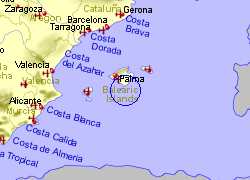 Map of the Cabrera National Park area.